When it comes to excessively dirty areas or tougher stains to be removed, you could keep going with the simple vinegar/water solution, or you could move up to a more powerful cleaning solution. Here it helps to understand what not to use. For vinyl, you’ll want to avoid using undiluted chlorine bleach, furniture polish or related cleaners, organic solvents and grease removers – as all of these pose potential danger to the PVC material that is vinyl siding. With fiber cement, the general rule is to never use harsh chemicals or abrasives. Instead, mild soaps or detergents will work for cleaning most tough stains. Fortunately, there are cleaning solutions that are specifically made for siding. These are sold generally by the gallon and you simply follow the directions on the container. Many of these are made to be used with a pressure washer. For vinyl, you can use household cleaners such as Fantastic, Windex or Lysol. When it comes to the grunt work of cleaning, be sure to first tape off, with plastic, all items you don’t want to get wet with the cleaning solution. In the event that your taped over area may have unnoticeable gaps, it’s best to wet your garden areas first before taping the plastic. This will slow down any absorption rate that those areas will have for embedding such chemicals into the soil, thus minimizing damage to plant roots. After protecting the environment, then work from the bottom up to avoid streaking. So, wash, rinse and move up to then repeat. Once the entire area up to the top is done, proceed downward again with dry cloth to wipe everything down. Preventative measures are a good way to minimize the need for hard cleanings down the road. This means trimming plant life near your house, so it isn’t brushing near your siding’s surface. Animals and insects will then be less attracted to the siding. If you must do work on your car or other contraption where grease spills are possible, take care and cover the siding at the time of that job. With vinyl, keep all heating sources, i.e. grills, as far away as possible from your home. Flames or high heat within 5 feet can lead to warped panels. Tip: Make sure your gutters stay clean as overflow from there will impact your siding first. With fiber cement, when cleaning is done, be sure to check for any areas that may need to be caulked again. This is an annual suggestion for siding maintenance and doing this around the time of cleaning is your best bet. With vinyl siding, repainting is unlikely to ever be needed. The original color for your siding will fade over time, but do so uniformly. In the event that painting is desired, you could use acrylic latex paints to achieve new color. Two coats, and you’re good to go. With fiber cement, painting is necessary, but assuming the original color was factory finished, you ought to not need it repainted for at least 15 years. Always check with the person that installed your siding for types of paints they suggest for updating your fiber cement siding. 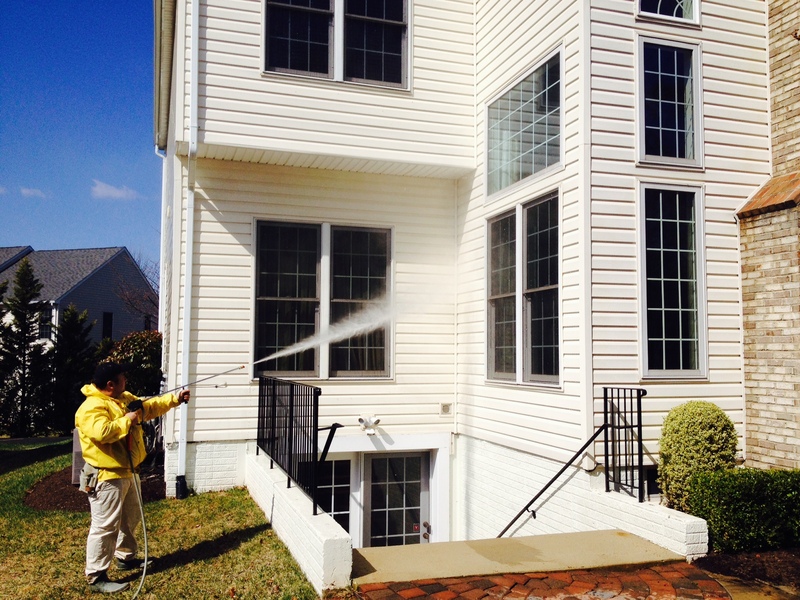 To hire a professional power washing specialist to clean your home’s exterior siding, it will cost about $200 to $300 on the low-end for a typical house, and $400 to $600 on the high-end for a larger house.